Architectures using Multiple AWS regions can be broadly classified into following categories:Cold, Warm, Hot Standby and Hot Active . Since the Cold and Warm Architectures are majorly classified under DR strategy/practices with RTO and RPO’s, the Hot Standby and Hot Active architectures alone are dealt in this article context as High Availability Architectures for Multi-Region AWS. The Following diagram illustrates a sample AWS Multi Region HA architecture. Workload Migration: Amazon S3 or EBS backed AMI’s will operate only in regional scope inside AWS. We need to create the same AMI’s in another AWS region again for inter region HA architectures. Every time when a code deployment is made, applications need to synchronize the executable /jars/configuration files across the AWS regions. Use of Automated deployments like Puppet, Chef will make things easier for such ongoing deployment cases. 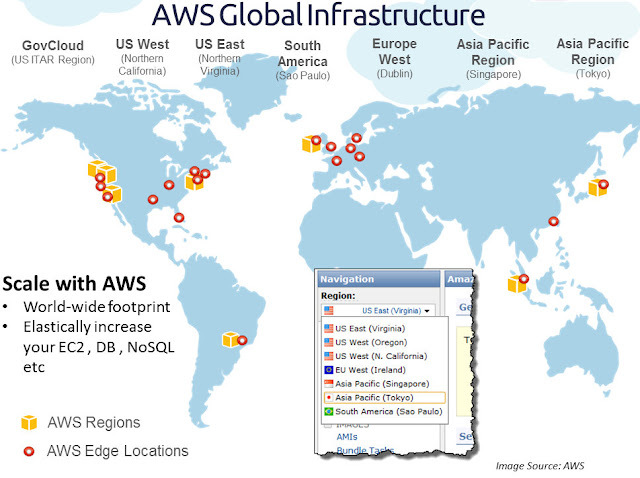 Point to Note: In addition to AMI's ; Amazon EBS, ElasticIP’s etc also operate in AWS Regional scope. Cache: Since Cache replication across regions are too costly for many use cases, it is recommended to follow Cache warming inside every AWS Regions. Since most these techniques are relying on Asynchronous Replication model, companies need to be aware of the Data loss, RPO and RTO they can incur in Architecting Multi Region AWS High Availability. 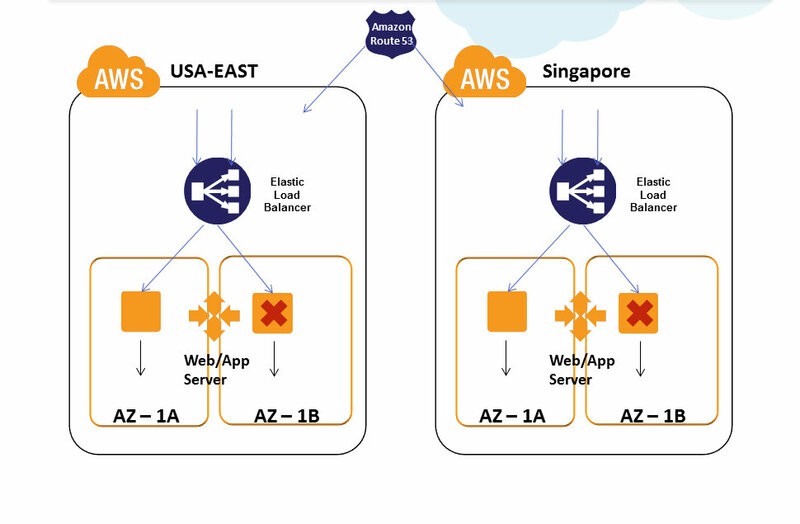 Load Balancers/RP’s like Nginx or HAProxy deployed on EC2 on an AWS Region can do this, but during outages where an entire amazon region itself is affected, there are chances that the RP EC2’s are also affected and they cannot direct the requests to another AWS region effectively. This will lead to website failure. It is usually a recommended practice to achieve this User Network traffic re-direction at Managed DNS level. Using solutions like UltraDNS, Akamai or Route53 LBR (Latency based routing) we can shift or balance traffic between infrastructures hosted on different AWS regions. Using Amazon Route 53’s Latency Based Routing (LBR) feature, we can now have instances in several AWS regions and have requests from our end-users automatically routed to the region with the lowest latency. We need to enter the EC2 instance public IP, Elastic IP, or Elastic Load Balancer target in the Route 53 console for LBR to happen. This LBR feature can be used for designing GEO Distributed Infrastructures and High Availability Architectures across AWS regions. Behind the scenes, AWS is constantly gathering anonymous internet latency measurements and storing them in a number of Relational Database Service instances for processing. These measurements help them build large tables of comparative network latency from each AWS region to almost every internet network out there. Amazon ElasticIP’s are also not transferrable across AWS regions. FTP and other IP Based TCP endpoints used or hardcoded for App-to-App communication needs to be re-mapped or resolved using DNS accordingly. This is an important point to be considered in AWS Multi Region Deployments.